The relational sermon structure, articulated by Andy Stanley in his work Communicating for a Change, uses the dynamics of relationships to organize the experiences of the sermon. The relationships considered are those between the preacher, the people, and God. According to Stanley, the sermon is built around relationship rather than content and intentionally fosters the formation of a relationship within which content is communicated to the hearers. It does this in five sections, moving from a personal orientation toward the topic (ME), to identification of how the community relates to the topic (WE), to illumination of God’s word on the topic (GOD), to application of God’s work in the life experience of each individual hearer (YOU), and finally to the inspiration of God’s people for God’s work among and through them in the future (WE). This sermon structure begins with an act of trust: the preacher builds a relationship with the people, sharing his personal investment in the focus or function of the sermon in a way that highlights the common ground he has with the hearers. Often this connection is one in which the preacher is honest about tensions or struggles he encounters in relation to the topic at hand. The preacher then expands participation in this personal experience by recognizing his hearers and inviting them to see the various ways in which they also are involved in the topic. Here, the preacher recognizes the diversity of the hearers and names the various ways in they relate to the topic at hand. During this engagement, God’s people have a vision of the community of faith, the body of Christ, and the experiences shared with one another and brought before God this day. The sermon, then, shifts at this point to consider God’s relationship with his people, allowing the text to clarify God’s work and his will for his people gathered this day. After this orientation toward God, the sermon returns to the people with a more personal approach (YOU), naming the way in which God’s word and work apply to each hearer’s life. In conclusion, the sermon moves from the individual to the larger community of faith. Here the preacher addresses the community again, noting the various aspects of faith experience brought up in the earlier communal section, often allowing the word of God to reframe that life experience, and ultimately turning attention to the future, sharing a common vision for God’s people based on this word from God today. 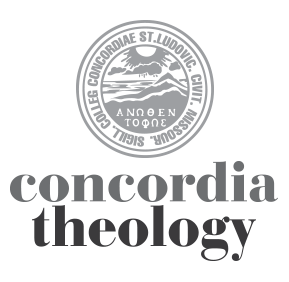 ConcordiaTheology.org is a resource that compiles some of the most interesting theological commentary and resources from a number of sources.